Schools are closed for summer holidays and we have a four-day long weekend. So, we make a staycation plan and decide to make a reservation at Crowne Plaza Yas Island in Abu Dhabi. Crowne Plaza Yas Island has a convenient location, Abu Dhabi International Airport is 8 kms away, Yas Waterworld, Yas Beach and all the other Yas Island attraction are just a few minutes away. 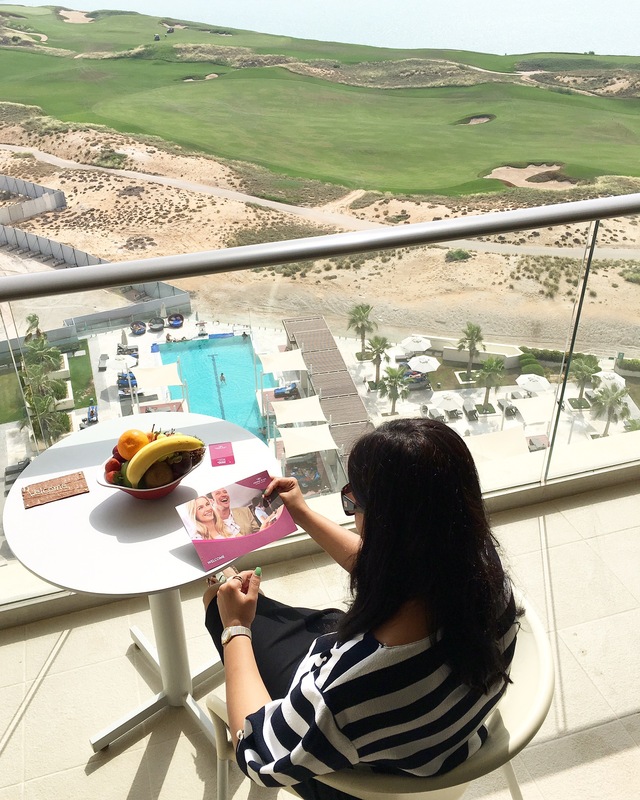 Crowne Plaza Yas Island has a gorgeous setting and it overlooks the golf course and the sea. Its a contemporary and sleek hotel efficiently managed by the InterContinental Hotels Group or IHG. As it was the Eid weekend, the hotel was crowded and there was a long queue for check-in. We liked the fact that the staff were super organized and efficient, and within a few minutes our check-in was done and we were handed our room card. The lobby of the hotel has trendy and modern decor with sublime lighting, colorful murals and vibrant carpets. It has a friendly and welcoming vibe. 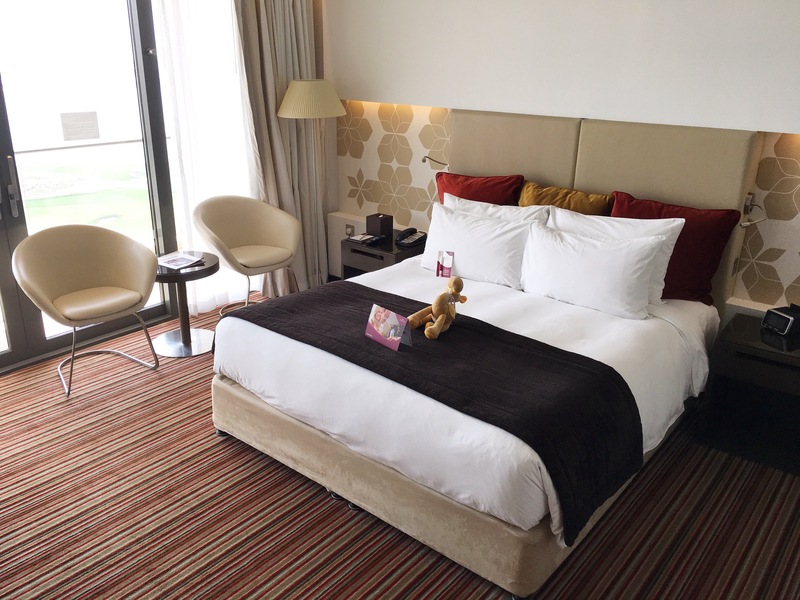 Crowne Plaza Yas Island is an elegant hotel with top notch facilities. This property has 428 guest rooms ranging in different size and style. Guests can have a choice of Deluxe Club King Room with Sea View, Superior Suite Sea View with Balcony, Deluxe Suite with Balcony, Superior Room with Plaza View and more. We stayed in the Deluxe Room Sea View with Balcony. Our room was spacious, cosy and comfortable. It was perfect for my husband, my 7 year old daughter and me. Our room was bright, sparkling clean and beautiful. The decor was classy and minimalistic. Everyone’s favorite spot was the balcony, which had a marvelous view of the sea, golf course and the swimming pool. The balcony had couple of chairs and table, I enjoyed my time sitting in the balcony and soaking up the view. As our welcome platter, we were offered sweet treats and fruits, which was highly appreciated by my family. I loved the personalized welcome card, which showed that the hotel really cared about their guests and they wanted us to have a great stay. Our bathroom was luxurious and it was of decent size. The bathtub was large and the bathroom had all the essentials like wash basin, top quality toiletries, bath robes, hair dryer, slippers etc. Crowne Plaza Yas Island has a big outdoor Swimming Pool and that’s where we spent most of our time. They have a separate Kids Pool too. The hotel also has state-of-the-art Gym, Sauna, Spa and Wellness Centre. In fact, I visited their wellness centre- ‘Senses‘ for a massage. Senses has expert therapists. The wellness centre has a calm and soothing atmosphere and I instantly felt relaxed. I felt refreshed and rejuvenated after the massage. 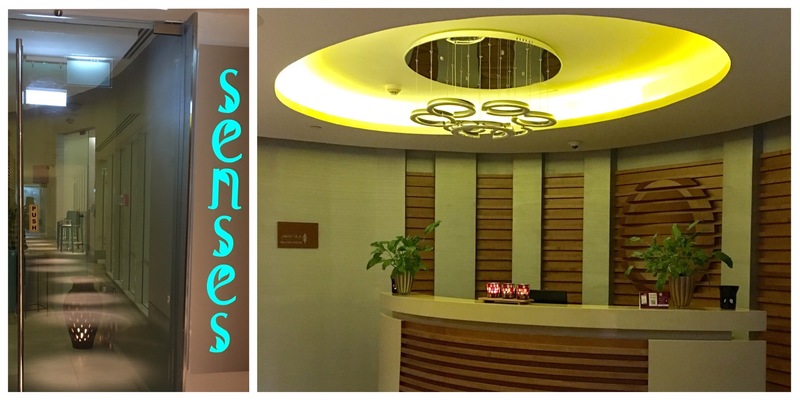 Prior reservations are recommended for the visit at Senses Wellness Centre. Crowne Plaza Yas Island offers good dining options. We had our breakfast and dinner at their all-day-dining restaurant Jing Asia. It offered a good selection of food from around the world. Apart from Jing Asia, there are other options like Views Lobby Lounge, Stills Bar and Brassiere, Barouk and Sundowner Pool Bar. 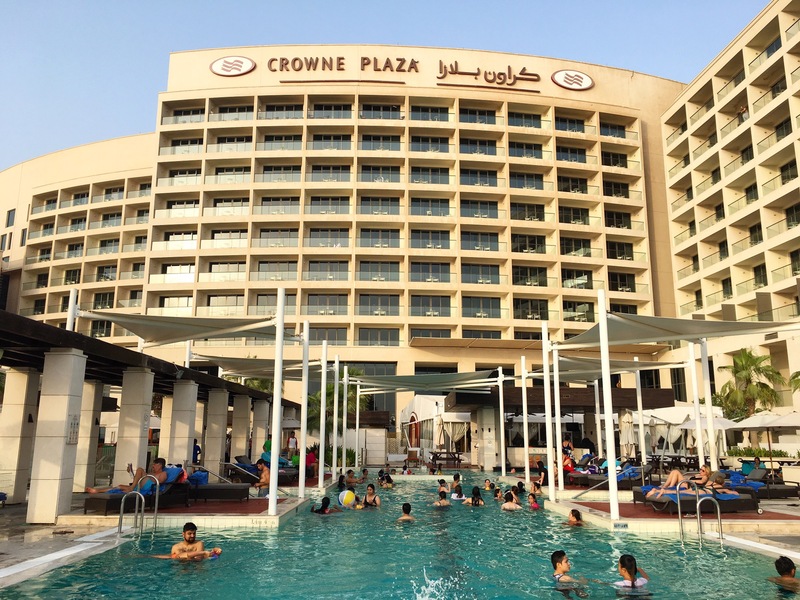 Crowne Plaza Yas Island offers various facilities like Kids Club, Indoor play area, Table Tennis, Squash, Currency exchange, Hair salon, Babysitting service, Business Centre, Meeting/banquet facilities, Shops and more. It also offers free private parking. The guests of the hotels get free complimentary tickets to the stunning Yas Beach. It was our first time at the Yas Beach and we really had a great time there. 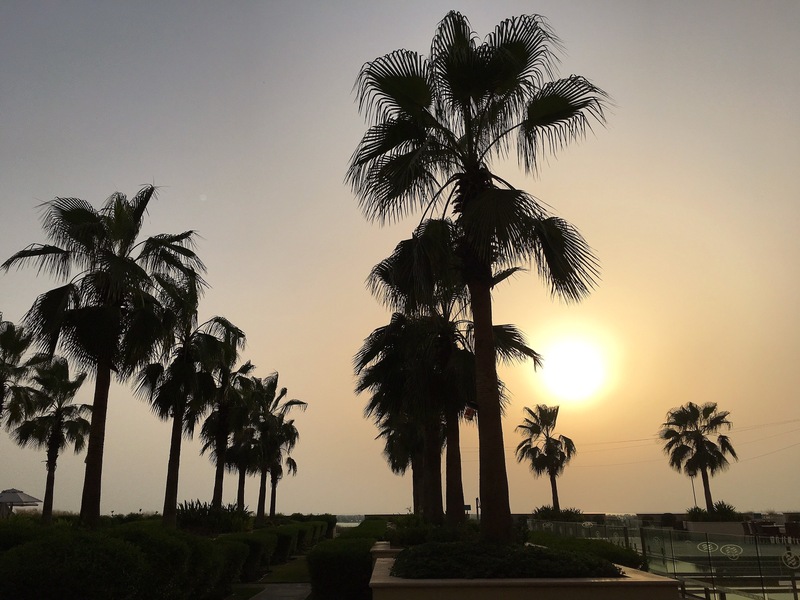 We had an amazing stay at the Crowne Plaza Yas Island. We enjoyed our stay in their property, we loved the warm hospitality, flawless service and top class amenities. Whether it is a business trip or a pleasure trip, Crowne Plaza Yas Island is the perfect hotel.